Forget the heavy racks,panniers,and trailers. With the versatile expandable S.I.C(Seriously Intense Cycling)Sack seat bag from Phantom Pack,Your carrying needs for your compressible camping gear is taken care of,In a light weight,rugged design. Allowing your single track sessions to go from hours to multi-day adventures,while still maintaining a high level of rideability and control. All products from Phantom pack Systems are engineered and constructed from the finest hardware and materials available today. All products are truly punished during the testing of each of our designs.To ensure that your Phantom Pack gear will get the job done,For the long haul. -Kevlar/Carbon or Carbon fiber semi-rigid stabilizer wings and now with updated better sabilizing polycarbonate reinforced bottom. -Resdesigned 4 way tension system gives complete control over making sure nothing is flopping around when the riding gets nasty! -1000d Cordura and Tuff-Tek materials are used in all high stress/high abrasion area's. -Main compartment of bag made of Dimension Polyant Vx-21 keeps out the rain. 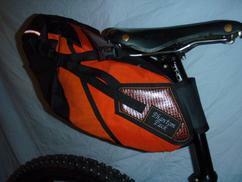 -Combine this versatile Seat bag with the Phantom Pack Rough Ride Handlebar bag for a bike touring/commuting experience that will leave you thinking,Why did I wait so long to switch to ultra-lite bike packing Gear? The S.I.C Sack is available in 3 sizes. -Keep in mind that if you are riding extreme terrain where you need to get behind the seat,To adjust your S.I.C Sack to a smaller size to allow for steep descents. -There are 3 default color theme's,Black with Olive green,Orange,or Charcoal grey trim.There is also red trim and all black for a under the radar stealth look. The small version of the S.I.C Sack is great for smaller loads,Day trips and commuting. The medium size S.I.C Sack is the most versatile and best selling of the line.With a volume of 4-8L,There's room for your sleeping bag or tent(minus poles),clothes etc,But can roll down to 4L for the small stuff on day trips. The Large S.I.C Sack=Big Smiles when it comes to carrying the bigger loads,With a volume of 6-12L it can handle med. to large size loads without the weight and noise of racks and panniers!